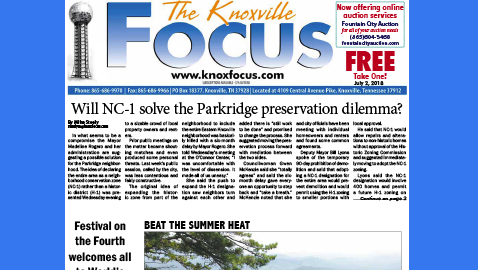 Will NC-1 solve the Parkridge preservation dilemma? In what seems to be a compromise the Mayor Madeline Rogero and her administration are suggesting a possible solution for the Parkridge neighborhood. The idea of declaring the entire area as a neighborhood conservation zone (NC-1) rather than a historic district (H-1) was presented Wednesday evening to a sizable crowd of local property owners and renters. Prior public meetings on the matter became shouting matches and even produced some personal threats. Last week’s public session, called by the city, was less contentious and fairly constructive. She said the push to expand the H-1 designation saw neighbors turn against each other and added there is “still work to be done” and promised to change the process. She suggested moving the preservation process forward with mediation between the two sides. Councilwoman Gwen McKenzie said she “totally agrees” and said the six-month delay gave everyone an opportunity to step back and “take a breath.” McKenzie noted that she and city officials have been meeting with individual homeowners and renters and found some common agreements. Deputy Mayor Bill Lyons spoke of the temporary 90-day prohibition of demolition and said that adopting a NC-1 designation for the entire area would prevent demolition and would permit using the H-1 zoning to smaller portions with local approval. He said that NC-1 would allow repairs and alterations to non-historic homes without approval of the Historic Zoning Commission and suggested immediately moving to adopt the NC-1 zoning. Lyons said the NC-1 designation would involve 400 homes and permit a future H-1 zoning on a block-by-block basis. He added that the meetings between the city and citizens during the six month interim found some common ground that both sides want. Becky Wade, director of community development, spoke of several city programs that could provide low interest or non-interest loans for repairs and said the city has allocated $2.5 million in the new budget, beginning July 1st, to help preserve historic properties. Asked about a time-table for the NC-1 proposal, Lyons said it might take “a number of months” and, if adopted before the 90-day demolition moratorium, could continue that without interruption. Several opponents to the initial H-1 push said the NC-1 would remove the objection about repairing non-historic homes. When Lyons suggested that the Parkridge Community Organization be the coordinator of the effort many residents objected and called for a mediator to head the effort. A past president of the PCO said although he favors the historic designation he is willing to compromise and said the neighbors need to continue talking. Lyons asked the audience, “What’s next?” and then added that NC-1 seems worth pursuing. “We have to proceed with what people want,” he said. Speakers on both sides of the issue more-or-less agreed that an NC-1 designation could work with some modifications if a neutral party, or mediator, guides the process. The next step is for McKenzie or another council member to request the planning commission take action to explore the NC-1 designation and to then bring it back to council for a vote. How soon that can happen and if it can be done before the non-demolition 90 day order expires isn’t known but Lyons said the request itself could extend the moratorium. The NC-1 designation request must include 10 acres or more or in an area adjacent to the existing H-1 area and begins after the process starts to exclude demolition. Mayor Rogero made a point that the “original H-1 proposal is still not viable” for the full size of the Parkridge neighborhood.